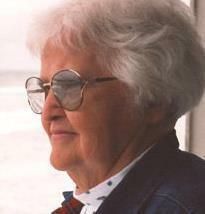 Mom loved holiday ‘surprises’ ….. Christmas, Valentine’s Day, St. Patrick’s Day, Easter, Independence Day, Halloween, Thanksgiving. And birthdays… oh, birthdays were always special. Today, Easter Sunday, holds pleasant and fun memories. Mom would get up early Easter morning (or stay up a little later the night before) to hide Easter eggs for us. My two younger brothers and I would get up Easter morning knowing that an egg hunt was about to take place. Excitement was near that of Christmas morning. While I have no photos of this event, I have vivid memories and can still feel the anticipation, excitement and joy. Depending on the weather, Mom would hide the Easter eggs either outside in various areas of our yard or inside, usually in the living room. Either way we were delighted. Mom would hide hard candy coated eggs that resembled gigantic Jordan almonds. She also included some jelly beans and foil wrapped chocolate coated marshmallow eggs. The bright, vibrant colors of the foil made those a prize indeed. Yet, I’d usually trade those with my brothers for other candy eggs that Mom had hidden. As it turned out, I did not care for chocolate covered marshmallow eggs, still don’t. I don’t really know why I told her that when I was an adult, but I seemed to know when I was a child that Mom liked the Easter Egg hunts just as much as we did, so I did not bother mentioning it. I still remember the fun and excitement of our Easter Egg hunts and look back on them each year as such happy childhood memories. Thanks Mom…. and Happy Easter!!! Speaking of Chocolate and Orange…. On January 26 I also ordered some of my favorite tea. 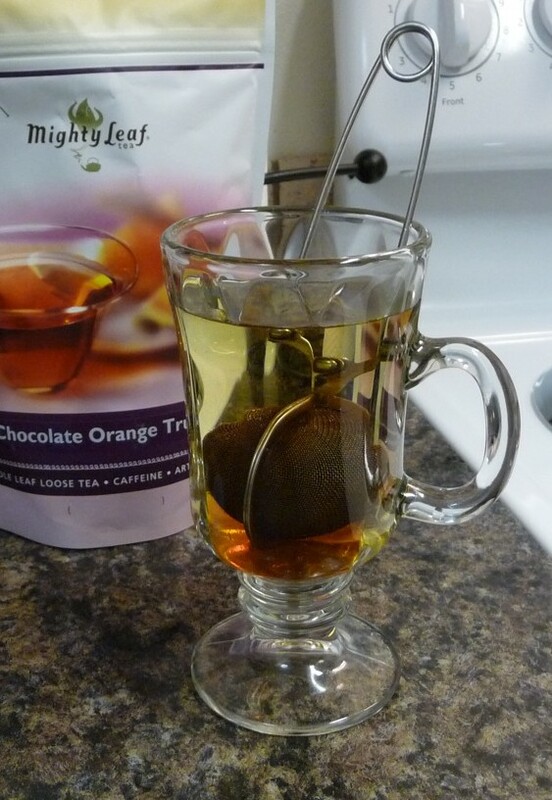 Chocolate Orange Truffle tea from Mighty Leaf Tea. Along with some other flavors, my special interest arrived just a few days later. Ahhhhhh…. Bliss Brewing. This past week, I took some of this wonderful tea to work with me to share with some friends. It is now one of their favorites too. A smooth, rich flavor brightens and warms the day and mood. A lovely thing to have at work, or anywhere for that matter. I imagine Mom enjoying this tea. Chocolate Orange Truffle tea is a delightful way to start off the day and a treat, pick me up, later in the day. Also, it makes a wonderful dessert tea. I’ve also thought about taking some of this blissful blend, placing it in a grinder or a food processor to break it up and then use it in something I am cooking or sprinkling some on a frosted treat. Sounds interesting to me. 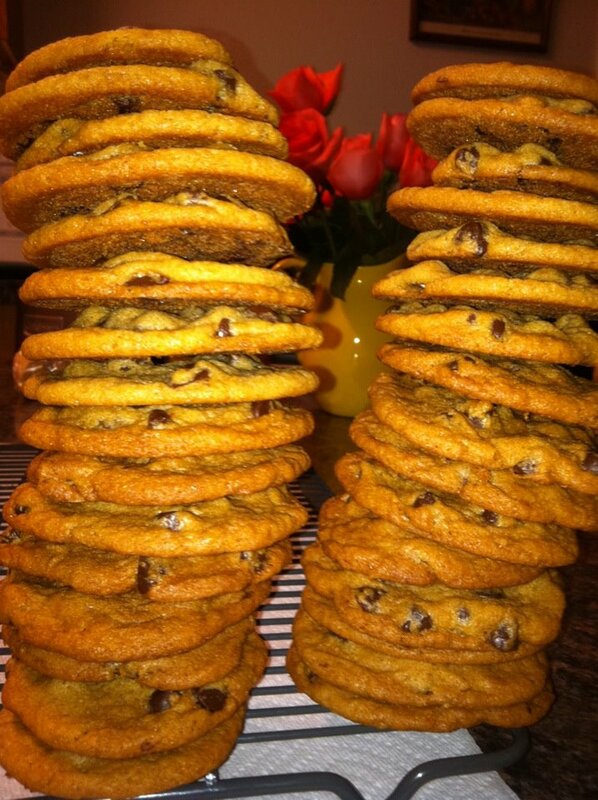 Besides the batch of rolls I had made on January 26th, I stirred up a batch of chocolate chip cookies. Yet, these were not your ordinary chocolate chip cookies. Yes, they started out as a basic recipe, but this time I tried something different. I added orange zest, orange flavoring and DARK chocolate chips to my favorite basic chocolate chip cookie recipe. As a little girl, I had little appreciation for the flavors of orange and chocolate together. I do remember that Mom liked the combination. I remember that I did not. However, as it so happened, my taste for flavors changed and I found myself liking the taste of chocolate and orange together. I REALLY like it. This combination must have to do with a woman’s maturity. I’ve spoken with friends about this and most have said they experienced the same. Mom already knew.